It pays to wander aimlessly. At least if you are a photographer it does, especially when in a new place. Take this image for instance. I was in Kansas City, which if you regularly read about my posts you will know just happened last week. I had some free time after work and made my way to their Union Station, which is a fabulous place I might add. After snapping some shots of the interior, I started getting the itch for some shots of trains. How cool are trains? It was an active train station at one point, so I had to assume there were trains there right? Well I wandered around to where the Amtrak passengers hang out until their train is ready for boarding - figuring there should be something I could see there. When I got there, a Security Guard sort of fellow asked me what I was doing, and of course I told him I was looking for trains (hoping he would not get all twitchy about the camera and tripod over my shoulder). He told me it was closed, would open again at 6am tomorrow, and the last train just left - and pointed me back in the direction from which I had just come. Hmmm. I told him I was from out of town, and take photos as a hobby, and just wanted to see some trains. I guess my polite Texas attitude softened him up because he told me to follow him. He took me through some random hallways and showed me where they keep some old train cars for their museum out back. He told me it too was closed (meaning I could not get in the trains) but I could look around. In a sort of train garage tucked under the building, I saw this beauty. There was a fence between me and this train, but the gate was slightly ajar which to me says “Come on in and take as many photos as you like”. So I did. I was especially happy to find these nice puddles on the ground in front of the train, being a fan of reflections and all that. 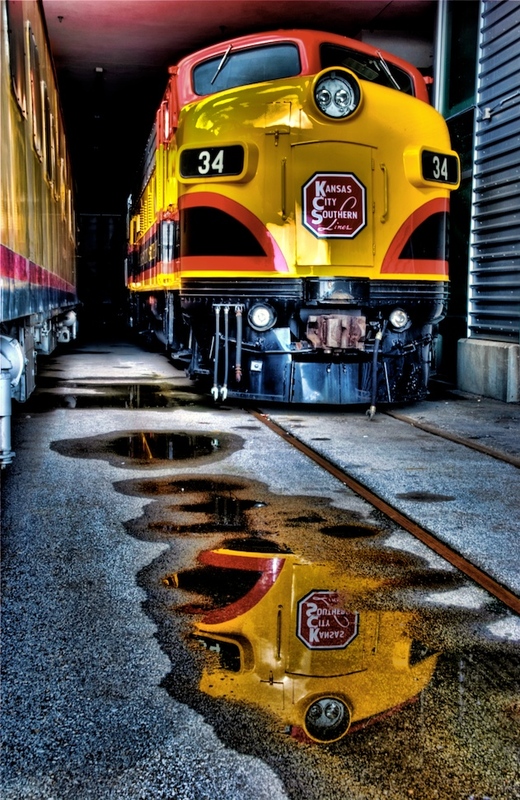 Anyways, hope you like it and look for more KC shots coming soon (including more train shots)! This is a 7 exposure HDR taken at f/14 with exposures from +2 to -4. They were merged into an HDR in Photomatix, and then I made some adjustments in PSE, Topaz Adjust, and Aperture. I used Topaz Adjust to give it some grit, so to speak, and really like the outcome. Hope you do too!